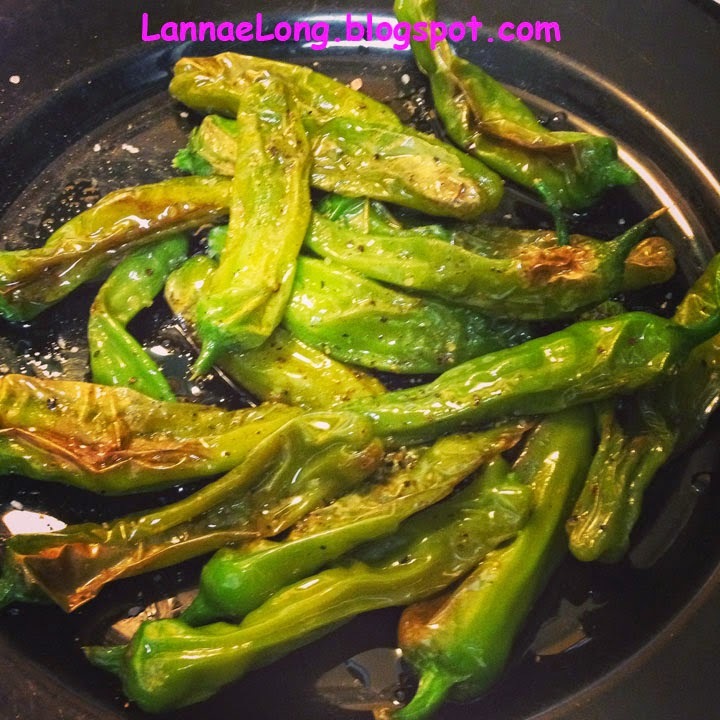 I hope you like my food and travel blog. The olive oil I decided to use is from The Olive Press, and I used the Mission variety. It is a pure EV olive oil with a bit of a peppery finish. The salt I decided to use is from Matanzas Creek Winery Lavender collection and it is Himalayan salt with lavender. The black pepper I decided to use is from Penzey's. One of my life's greatest pleasures is to break bread with friends, old and new, and have a good chat while dining on a good meal. Third Thursday Potluck feeds my soul, and my tummy. I am a sucker for a good potluck, and I love hearing people talk about their dish. A few days ago, I was invited to my first Third Thursday Community Potluck, and it felt like "coming home" with my new friends who are like-minded with me when it comes to food: fresh, local, seasonal, and most of all tasty. Third Thursday started many years ago. Who ever shows up, brings a dish, maybe a beverage too, and dinner begins. 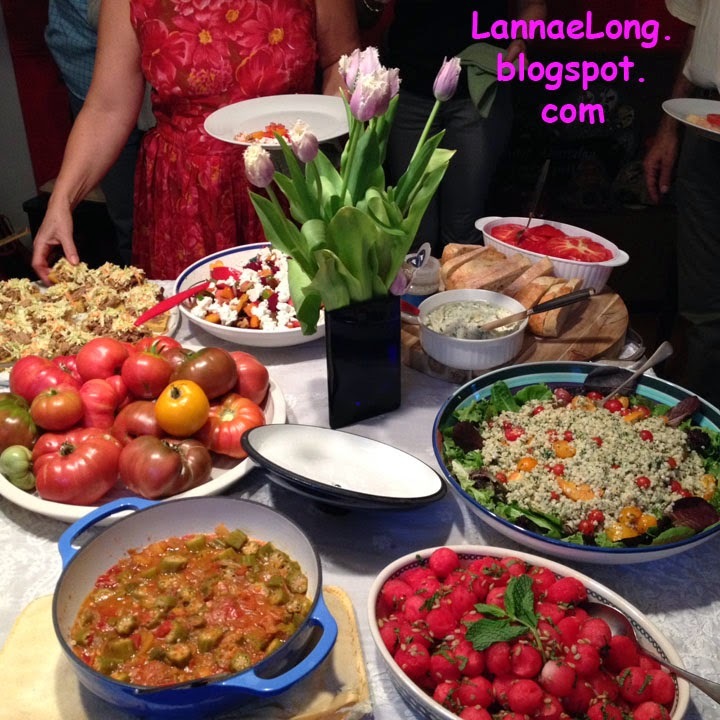 I caught wind of this potluck years ago, when a well respected leader of farm fresh foods was have a going-away party. Marne, in my opinion, was the leading force for Nashville to get to where it is today with regards to farmers markets, regular ol' folks like me to get access to locally grown and raised foods, and to get regular ol' folks like me to support local farmers and restaurants who support the local growing economy. Every time I walk into a farmers market in the Nashville area, I quietly thank Marne, and all those who have come after her to make it possible for me to have access to excellent fresh ingredients to make my meals and keep us fed. I left this potluck years ago, I hugged Marne goodbye, sad to see her go, but wishing her and her family all the love and wonder in their new adventure. As I left this potluck while saying goodbye, at the same time, I hugged and said hello to Nancy Vienneau, author, Tennessean writer, and caterer extraordinaire. 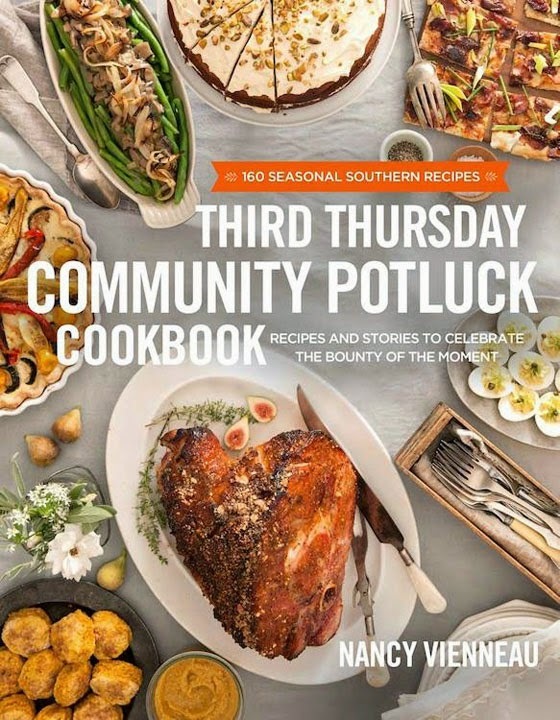 Recently, this year, Nancy had her new book, Third Thursday Community Potluck Cookbook, published by the local publisher Thomas Nelson. I could not wait to get this book, and of course have it signed by Nancy. All the first few book signings were on days I was either out of town, or committed to another activity. Finally, one Saturday, Shimai Pottery and Gifts located at the Loveless Cafe, hosted a demonstration kitchen and book signing for Nancy's new book. I hightailed it over there for a little snack, hear about the book, and gush over Nancy's accomplishment! Nancy's book is divided up by month, of what is in season by month. It is not divided up like other cookbooks which are usually apps, salads, soups, pasta, meat, veggies, desserts. 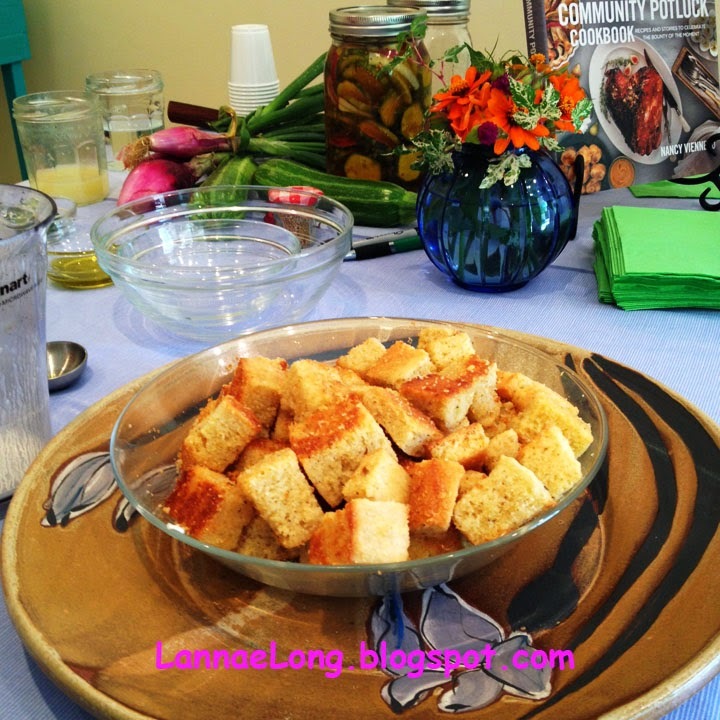 This cookbook celebrates the bounty of NOW, what can I get fresh from the farmer's market now! What a great idea to divide up a cookbook this way. I can just flip to July and August and have the main ingredients which are fresh NOW! and I can just waltz into the farmer's market and get the ingredients and make the dish. For all the years of Third Thursday Potluck, Nancy kept on saying there has to be a book, a cookbook, in this monthly event. There are so many people involved in Third Thursday. Each one has a dish they love with a passion for flavor. As I stepped into the potluck last week, it was so fun to ask who made which dish. K made an luscious raw tuna appetizer, it was fun to tell her how much I loved tasting her dish, and she truly was happy that everyone loved her dish. There was a spicy cheese dip which we all talked about how fun it was that the burn sneaks up on you. I really enjoyed a watermelon dish which had citrus and herbs on it. Because were are in the South, home of TN smoked pulled pork BBQ, there was a really nice smoked pulled pork dish. There were dishes with okra, tomatoes, squash, zucchini, pasta, quinoa, asparagus, and more! One dish at the potluck I recognize from the cookbook is the Southwest quinoa salad made with avocado, tomatoes, onions, lime and other Southwest style ingredients. I enjoyed the quinoa because the local fresh ingredients provide such a vibrant flavor and texture to the dish. I brought what I have been doing a lot of lately - pickles in three varieties. I brought traditional kirby cucumber garlic dill pickles, hot banana pepper pickles, and grapes with pumpkin and savory spices pickles. I source most of my ingredients from the most tasty sources I can. The cucumbers and dill are from the Barefoot Farmer, the garlic is from Bugtussle Farm, the banana and cayenne peppers are originally from organic seed and grown organically in my garden, the spices I use are mostly from Penzey's because I think they have a lot of flavor, and I have recently switched to Himalayan salt, instead of regular grocery store brand salt. The Himalayan salt is a huge mountain of salt, and is the 2nd largest store of salt in the world after the ocean. The Himalayan salt mountain was formed years and years ago, before there was any human, industrial, medical, yucko waste being washed into the oceans. The pickled grapes are snacks I love. The flavor is unexpected. 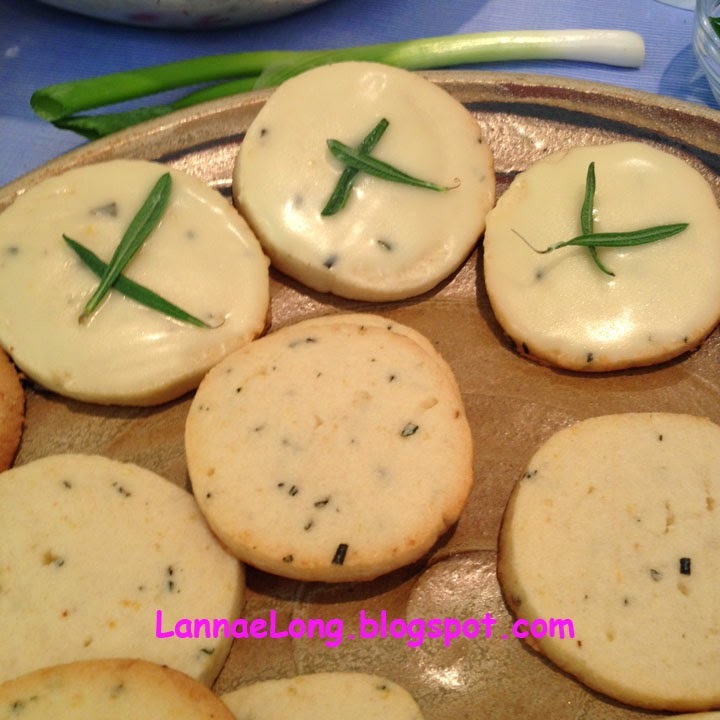 They are made with a bread and butter brine of vinegar, sugar, a dash of salt and loads of spices. I think potluck folks really enjoyed the grape pickles because many of them have not had this type of pickle before. I have a month before the next Third Thursday, but I am now thinking about what I can bring to the August Third Thursday Potluck. This week I started a ginger pickle in red wine vinegar (which I make at home), and I was thinking of something to make with that. Or maybe, I should just look through the summer recipes in the Third Thursday Cookbook for some excellent inspiration for what is fresh and in season. Either way, August Third Thursday is certain to nourish my body and may heart.